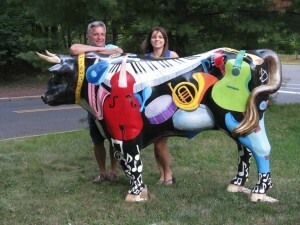 Ronald Balerno and his daughter Leah Balerno, both New Jersey natives, have always had an abundance of art and cultural influences in their lives. Ron attended Tyler School of Art majoring in Fine Art and Printmaking. His creative mind and spirit led him to pursue a career in the arts and he is the owner and founder of Aztec Graphics Inc., a regional printing and embroidery company. Ron is an avid painter and musician and has been a resident of Pennington since 1995. He finds inspiration for his work from his life and nature. This love for the arts was passed down to Leah who also enjoys creating in multiple mediums, such as Clay, Glass, drawing and painting. Leah currently works in commercial real estate, but still finds time for her creative spirit.